Please log in to pay dues, re-sign books, update your contact information, and view secure documents. Applications for the 2019-2020 Scholarship Program are available. Applications must be received by July 1, 2019 to receive full consideration. You can contact the Local 683 office, 614-294-4786, or the IBEW Local 683 Education Trust Fund office, 844-683-0683, for the application. This scholarship is open to the children of Inside Journeyman Wireman and Journeyman Installer Techinicians who meet the proper criteria; 1) unmarried 2) under 30 years of age and 3) has been admitted or is already enrolled as a full-time student in an accredited post-secondary institution. We are looking for volunteers from Local 683 to help with electrical repairs to homes of elderly and disadvantaged homeowners in Central Ohio. We will be performing the majority of the work on Saturday, April 27th and we will finish any work not completed on Saturday, May 4th. 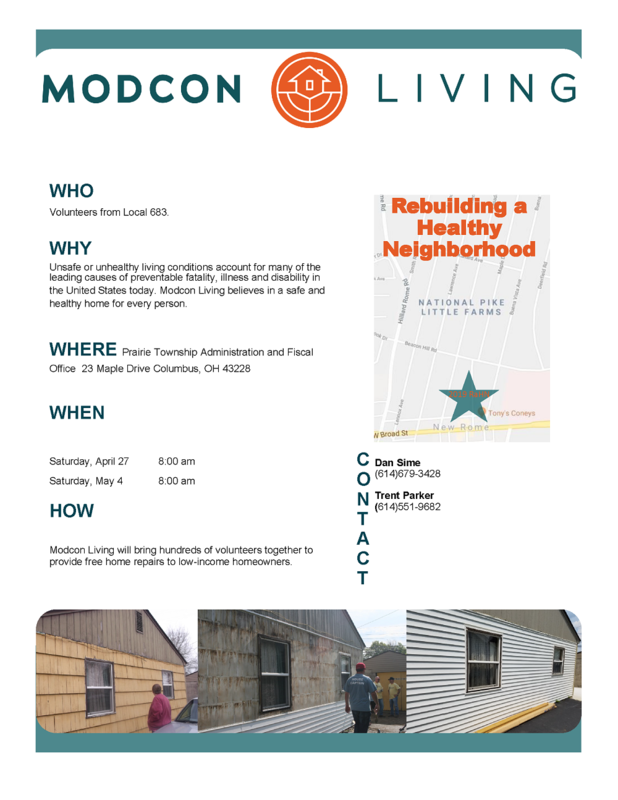 We will be meeting at the Prairie Township Administration and Fiscal Office located at 23 Maple Drive, Columbus OH 43228, on both Saturdays. A free T-Shirt, coffee and donuts will be provided in the morning and lunch will provided at the project you are working on. Volunteers from Local 683 have generously given their time and skills to help with this worthwhile cause for the last 23 years. We ask that you bring your hand tools, cordless drill and any other tools that you have to help. To sign up contact Bob Garich - 614-277-9624, leave a message if necessary with your name and phone number. Deadline to register is March 26th, 2019. The Tournament for 2020 will be held in Augusta, GA. Please contact Brian Hughes or Mike Kuhn as soon as possible. We only have 40 spots to fill. WE NEED CONFIRMATION NO LATER THAN APRIL 7TH. League starts April 22nd at the Links of Groveport. Cost this year is $275.00. You will need at least $140.00 April 22nd. The outing is scheduled for September 14th at the Players Club (Foxfire), 8:00 am shotgun start. The first Union Meeting of the year will be January 10, 2019 at 6:00 pm. Per recent By-Law changes, we will only have one Union Meeting per month. This will be the second Thursday of each month with a start time of 6:00 pm. You can now pay your dues on our website. From the Member Info bar select Pay Dues. You will need your credit card number, the 3 digit security code, name, address and an email address to email the payment confirmation. Due to high merchant fees we will no longer accept Discover and American Express. There is now an application available which will allow us to send instant messages to your phones. It is called Unionsgetit. It is available through the Apple App Store and through Google Play Store. You will need to enter our local number, 683, and your card number to get started. The International Brotherhood of Electrical Workers (IBEW) represents thousands of members in the US and Canada. IBEW Local Union 683 provides highly skilled electricians and technicians serving all of Columbus and central Ohio. Since 1891, we have been providing quality workmanship in the residential, commercial, industrial electric and telecommunications industries. Contact us today and let us show you what we have to offer and how we can help you and your company succeed. 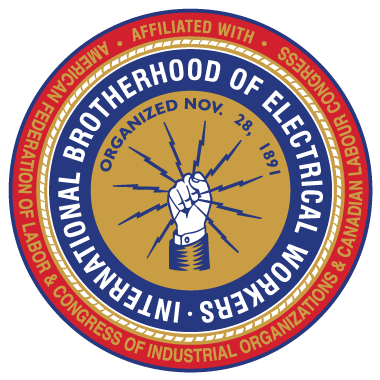 IBEW Local Union 683 received it's charter from the International Brotherhood of Electrical Workers on November 5, 1924. Since then, IBEW Local 683 has provided quality craftsmanship to central Ohio. We are proud of our membership for the dedication, knowledge and skilled experience that they continue to provide. Are you an Electrician? Find out why you should join a Winning Organization where your talents will be appreciated and rewarded with fair pay and benefits. This website is produced and hosted by IBEW members.